Interview and photos by Streets Dept Contributor, Eric Dale. 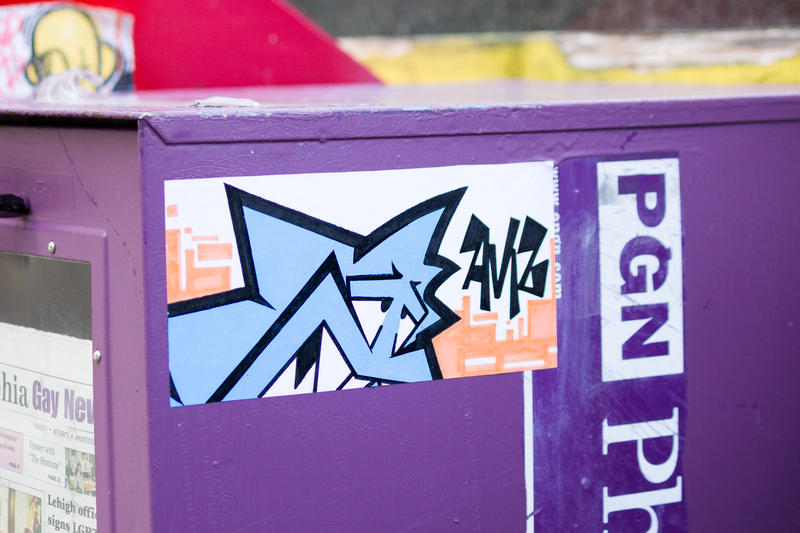 Few street artists in Philly are quite as prolific as Philadelphia sticker artist Avizzle, or Aviz. 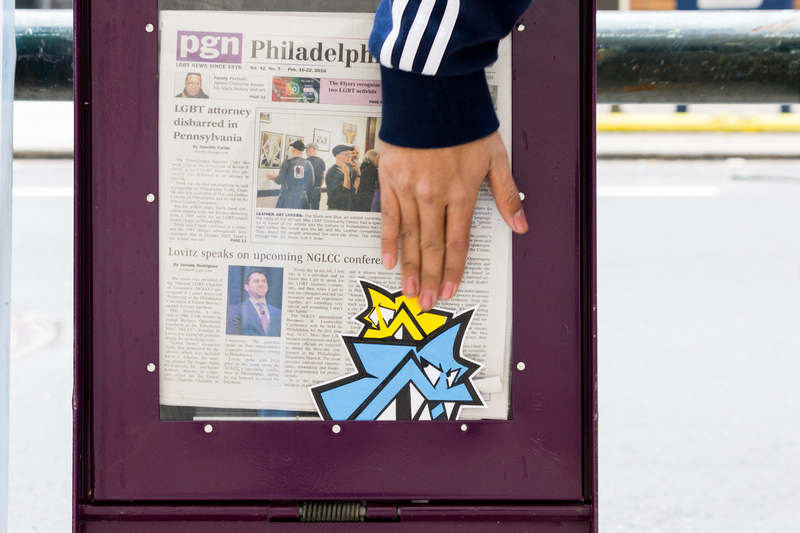 Center City street signs and newspaper boxes are filled with his work, but you can also find his character on less-trafficked residential streets throughout the city. 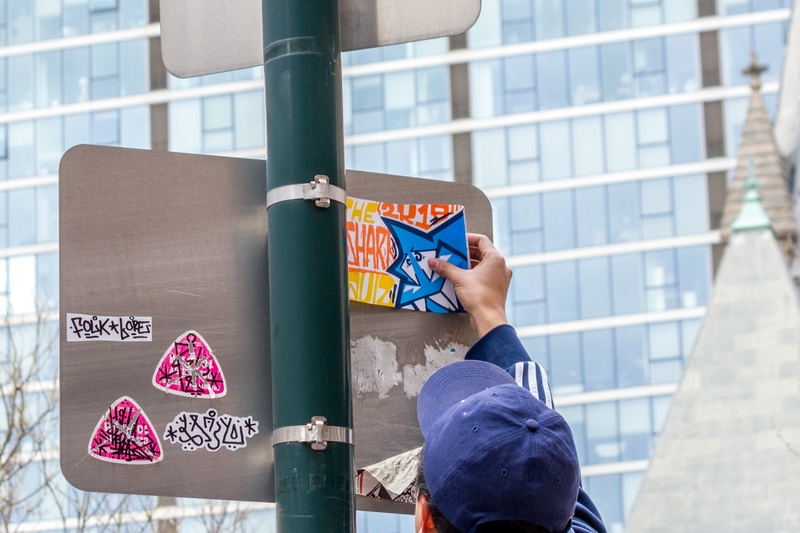 His stickers are so abundant because his goal over the four years he’s been putting them up has been to perpetuate Philly’s unique, hand-drawn sticker tradition – and maybe bring it back from the brink. 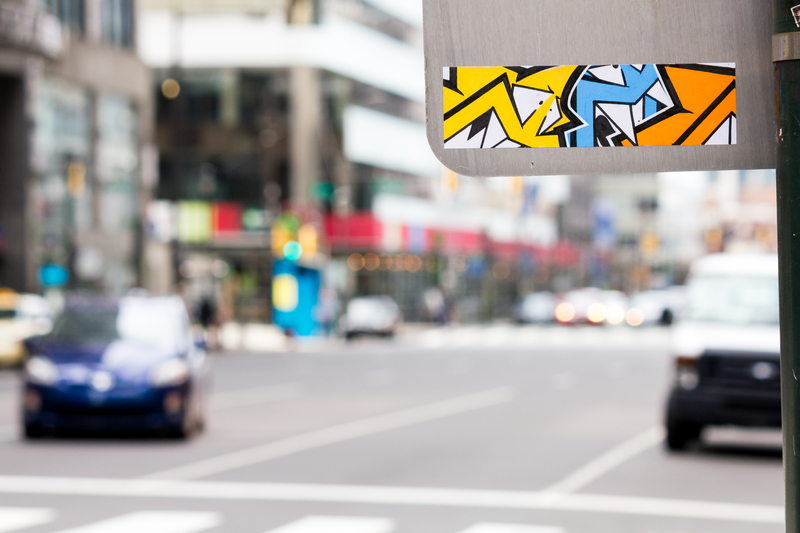 For today’s latest Interviews with Street Artists, Streets Dept’s Eric Dale talked with Aviz as he put up some fresh stickers around Center City! 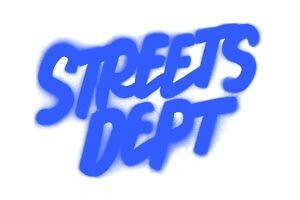 Streets Dept’s Eric Dale: How did you get started doing stickers? Avizzle: Originally, I got into the whole thing because of Snod. He introduced me to stickers early in the game, and I thought it was the coolest thing ever! And then I researched it and realized Philadelphia has a community. That’s how I kind of found my place. SD: What’s the origin of your character? AV: When I first started, I was just thinking “I need to have my own character!” So I started creating a bunch of random characters. 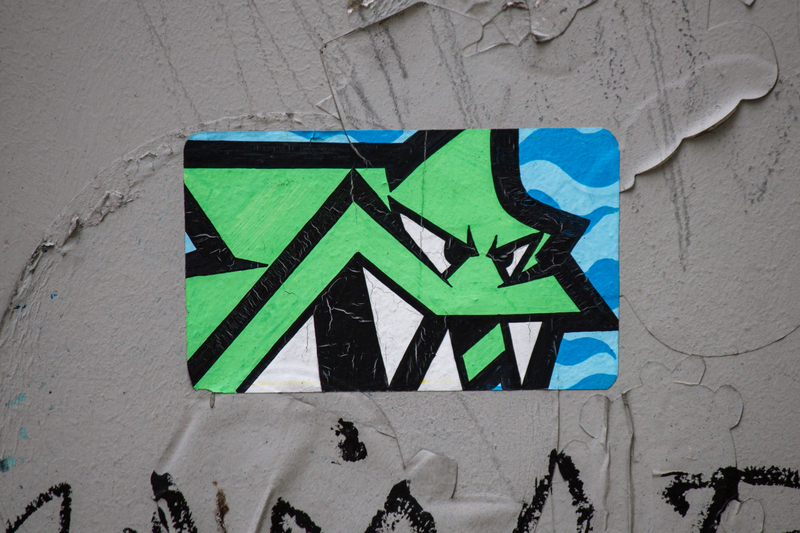 But Philly has a distinct style that a lot of sticker artists had back in the day – it’s not something that you can just pull off Google Images. There’s a certain aesthetic, so I tried to follow that. SD: So your character has evolved over time? AV: Yeah. I had a notebook, I remember, where I had created 10 different characters. Then I narrowed it down to two, and then to one. But the first one kind of looked like this one guy down in South Philly named Kaddy. So I changed it up a bit, and over time elaborated on it and it started to take its form. It takes a while! I knew how to draw, but for the first six months it was really rough. When I first started, I made it super aggressive and grim – like, sinister. But once I figured out my style, I just stuck with the more cartoony look. Technically, my character was supposed to be a dog, but it got so misconstrued! Now it’s a shark, I guess. SD: You’ve previously described sticker art as a hobby. What’s the most fulfilling part of it for you? AV: I would say just walking around the city. 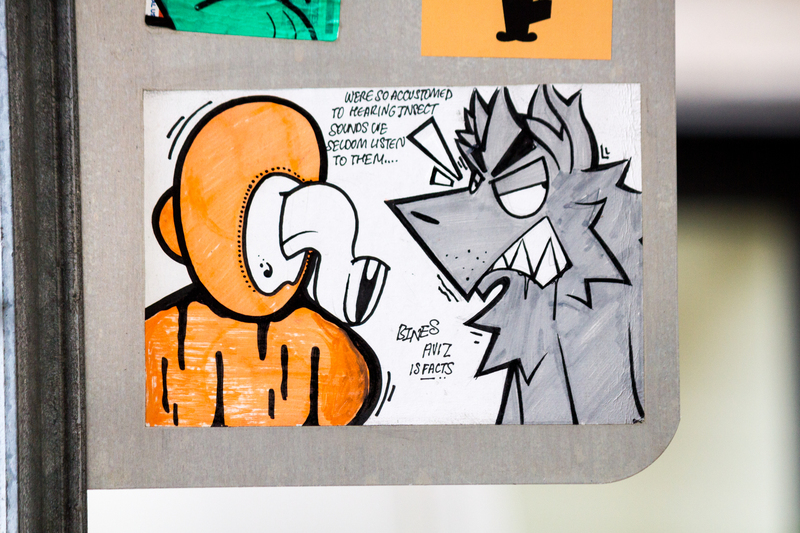 Before I got into sticker art, I didn’t really go out that much. 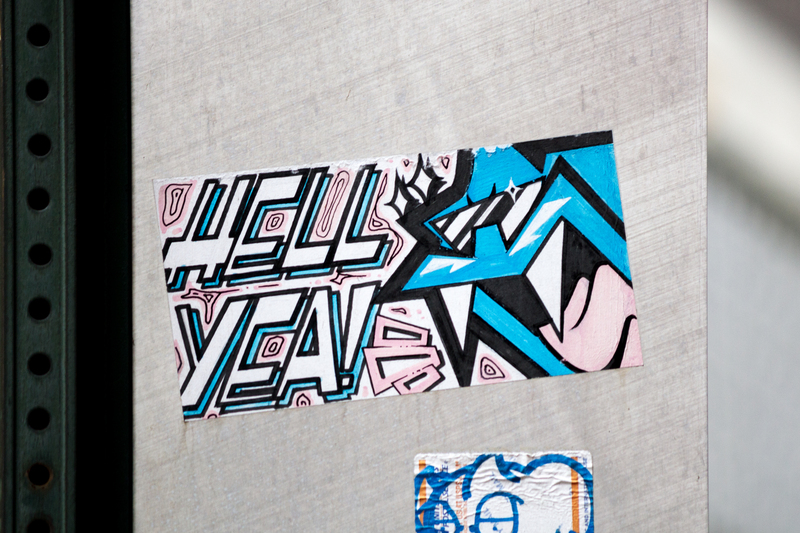 So getting into stickers made me more active in the streets – just knowing what’s around and also experiencing things that I never knew existed. I would go to random areas – Northern Liberties for one. I would never go there if it wasn’t for stickers. Or up in the middle of West Philly – there’s no reason for me to go there. SD: Do you think it will ever be more than a hobby? AV: …No. Haha! If it ever got more, like, commercialized, it wouldn’t have that same aesthetic anymore. If I did do commercial art, I’d keep it separate from the stickers. You know how they say “if you do what you love, you’ll never work a day in your life?” Sometimes, you’re going to start to hate it! The idea of becoming an artist sounds great – you get to create whatever you want and make a living off of that. But around a year ago, I felt like I was forcing myself to create in order to get recognized. I was pushing myself to come up with 70 plus stickers for the week, and I felt like I really shouldn’t be doing that. At the end of the day, it’s stickers, and I should just keep it to the culture. I’m not trying to diss on anyone who does it for the reputation, cause that’s the whole objective of street art! But that’s what it came down to for me. SD: How do you choose spots for your stickers? AV: It depends. For the ones that I really want to last, I look for a really smooth surface. I definitely won’t put them on a bumpy surface. I usually try to find a nice clean sign that doesn’t have any old stickers on it; if you put a sticker on top of that, it’s more prone to fall off. Same thing for bins, but the bins are starting to get really buffed. The buff is a lot harder than it was back then. The city is changing so much and so quickly. SD: Even so, I think I must have seen a thousand of your stickers at this point. Even more impressive, I don’t think a single one wasn’t hand-drawn! AV: That’s the thing – I do see it as a hobby, just something to do when you have free time. 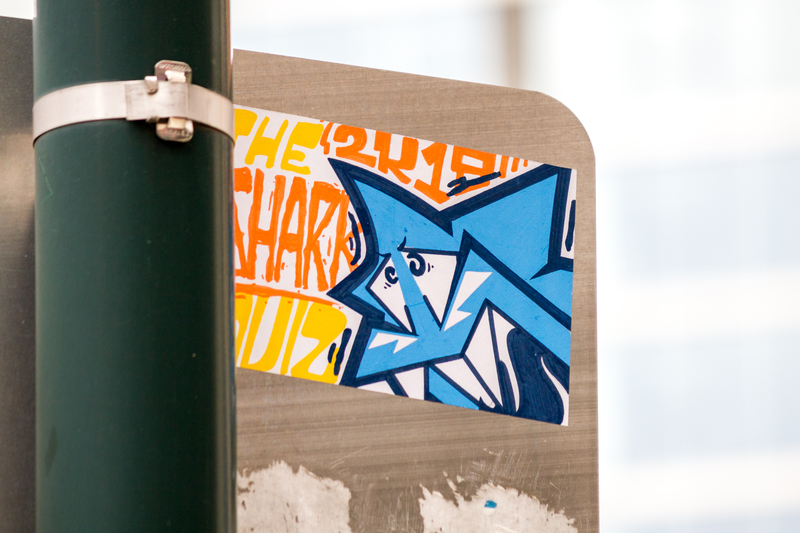 I like to keep it traditional, in the sense that Philadelphia has a whole culture of hand-drawn stickers. It might not seem like it nowadays because a lot of artists dropped out, but that was THE thing: cut out, colored, hand-drawn stickers. I like the aesthetic of that – it doesn’t look so much like graffiti; it looks like it’s part of the environment when it’s cut out or flush with the surface. It makes it livelier! There aren’t a lot of cities that have kept that tradition. Philadelphia is one of the few, or maybe the only. SD: Two years ago, Streets Dept posted a photo of your character holding a sign saying “revive sticker art.” What was the impetus for that message? AV: Back then, I didn’t realize that the buff was actually getting harder. I just thought that there weren’t too many people out there. I was really into stickers – I was just like “IT CAN’T END!” So I was trying to be like “hey guys, the streets are still clean…” Haha! But in reality, the buff was just starting to get harder. I didn’t realize that until later on. SD: So has sticker art been revived? AV: To some degree. There are some newer people that are coming up. I definitely like Lazy and Septic – they’re killing it. SD: They are so up! AV: Yeah, they are on a level that I didn’t even know it would come to. And there are some other artists who are coming back out. It’s not as big as it was before, but it’s definitely starting to make a comeback. I feel like the city is slipping up a little bit in terms of buffing, so it’s not as bad, but the only problem is the signs keep getting higher and higher. So you have to climb! SD: Are there any other messages you convey with your art? AV: Not really. Just the culture of character art – that’s the whole agenda. I think that [‘revive street art’ sticker] was the first time, kind of the only time, that I took a stance on something. It’s something I definitely do not do often. SD: What type of art would you like to see more of on the streets of Philly? AV: I don’t know… I guess sticker art! Like the old school dudes – I love their stuff! They’re so good. SD: Thanks for walking around with me and talking about your art! 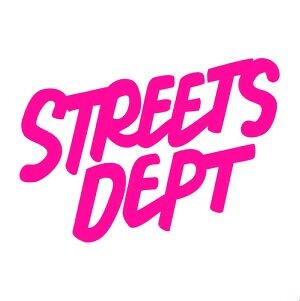 Read previous Streets Dept Interviews with Street Artists here: Blur, Inphltrate, Darkmeal!